Party leaders met on Wednesday after the “dishonourable” conduct displayed by some honourable members of Parliament to discuss whether disciplinary action should be taken against those who were seen to be behaving in a rowdy way. No decision was taken, but Parliament sources say Speaker Karu Jayasuirya is likely to warn some MPs when Parliament meets next. Wednesday’s ugly scenes once again raised questions about the colossal amount of public funds that go into each parliamentary session, only to have MPs behave in an unruly manner. The Campaign for Free and Fair Elections (CaFFE) pointed out that Wednesday’s multi-MP brawl was the latest in a long line of such incidents. Interestingly, former minister Gamini Lokuge, one of the chief actors involved in Wednesday’s fracas, was part of a group that roughed up leftist leader Vasudeva Nanayakkara in a similar incident around 1992-1993, while Mr Nanayakkara was trying to make off with the Parliament Mace. In an example of turncoats and political fickleness, Mr. Lokuge and Mr. Nanayakkara now find themselves on the same side in the Joint Opposition (JO). CaFFE also accused the Government of orchestrating the brawl with the aim of diverting attention from the Treasury bond issue. It also alleged that Prime Minister Ranil Wickremesinghe had directly supported the action. Some MPs who did not get involved in the brawl voiced concern on social media. 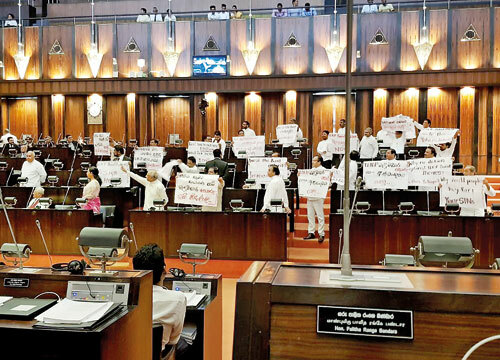 United National Party (UNP) MP and Deputy Minister Harsha de Silva said he had been told that never in history had there been such a brawl in the Chamber as the one witnessed on Wednesday. Deputy Minister Ranjan Ramanayake said that about Rs.5 million in public funds was spent to run Parliament on a daily basis. “They don’t care, they will leave even after taking the daily attendance allowance,” he said, adding that he was referring to “all MPs who make trouble,” irrespective of the party. Wednesday’s special sitting was supposed to see the tabling of the report compiled by the Commission of Inquiry into the Treasury bond issue. With the President’s office informing the Speaker that copies of the report would not be available till next week, tempers, which had already been running high, exploded when Prime Minister Ranil Wickremesinghe rose to make a special statement. In the end, fists, missiles and filthy language were thrown in abundance as UNP and JO MPs got into a free-for-all in the well of Parliament. Shouts of ‘Hora Hora, Ranil Hora’ (Thief, thief, Ranil is a thief) from the JO elicited the response ‘Hora Hora, Mahinda Hora’ (Thief, thief, Mahinda is a thief) from the UNP. The shouting match ultimately resulted in a brawl. MPs also hurled books, pens and files. Among those seen to be involved in the brawl were MPs S.M. Marikkar, Chaminda Wijesiri and Hector Appuhamy from the UNP and Gamini Lokuge, Prasanna Ranaweera and Prasanna Ranatunga from the JO. A number of MPs from both sides received minor injuries. Several female MPs too became unwittingly caught up in the melee while trying to calm down their male colleagues. Senior Additional Solicitor General Dappula de Livera who had been in the news recently has been given a Mercedes Benz car. Mr. de Livera hit the headlines when he appeared for the Attorney General’s Department at the Bond Commission sittings and mainly when he aggressively cross examined former minister Ravi Karunanayake. The Benz was given to replace the Toyota Corolla three number series car that Mr. De Livera had been using. The Mercedes Benz has been used by several former AGs and is about seven years old. The serving AG has been given a new hybrid car. With less than four weeks for the local council elections the Sri Lanka Podujana Peramuna (SLPP) campaigning under the leadership of former President Mahinda Rajapaksa is having second thoughts about using betel leaves to welcome their leader and chief speakers at election meetings. This comes after complaints from some of the party organisers and supporters who claim that the use of betel leaves may give the impression that they were campaigning for the United People’s Freedom Alliance (UPFA), whose symbol is the betel leaf. SLPP frontliner and Dehiwela-Mount Lavinia former mayor Dhanasiri Amaratunga said they had suggested that the SLPP leaders be welcomed with lotus flowers, because the lotus bud is the symbol of the party. Political observers say political rivalry is so bitter that even long-standing traditions are being chewed and spat out. The law’s delays are widely known to have reached staggering proportions in Sri Lanka, but the latest figures released are shocking and show how justice is being delayed and denied because of the long drawn-out procedures. About 750,000 cases were pending in courts as at September, 2016, with the largest number of some 535,000 cases in Magistrates’ Courts, according to statistics released by the Justice Ministry. The ministry says 3,486 were pending in the Supreme Courts, 4,817 inthe Court of Appeal, 5,890 in Civil Appellate High courts (5890), 16,811 in High Courts, 167,945 in District Courts, 535,644 in Magistrates’ Court, 5,048 in Labour Tribunals, 175 in Board of Quazis and 5,376 in Quazi Courts. Political parties appear to be ready to pull any stunts to secure votes and draw big crowds for their campaign meetings. One such stunt was staged in Jaffna on Friday when the Sri Lanka Freedom Party (SLFP), which is fielding its own candidates in the North, played a Tamil Eelam song to draw a bigger crowd for a ceremony held in a hotel to release its manifesto. The song referred to the military occupation of lands belonging to the Tamils and the oppression. The song begins with the words, “Niththiraya Thamila, Nimirnthu Paarada” or (Tamils, are you sleeping? Awake). The song sung by the late S.G. Shanthan was played before the meeting. The song referred to how lands belonging to Appu and Aachchi (a reference to Tamil ancestors) had been taken over by ‘Appuhamy’, a reference to a Sinhala person. The event was organised by SLFP’s Jaffna Organiser and parliamentarian Angajan Ramanathan, but some party members were taken aback when they heard this song. A separate manifesto focusing on rural development for the Northern Province was also released at the event. The new electoral system was supposed to do away with the war for preferential votes. Old habits though, die hard and many candidates continue to go about pasting cut-outs and posters of themselves, knowing full well that authorities would remove them. Social media is a different political scenario altogether. With no means of policing propaganda on the web, candidates are making full use of social media to ‘market’ themselves to eligible voters, though the campaign needs to be carried out in a limited area or more specifically a ‘ward’. The fact that they need to only market themselves to the voters of their wards makes no difference. Facebook pages of political parties too are promoting various candidates. Some of them also get rather carried away when it comes to catchy slogans for themselves. This can produce some rather hilarious results. A case in point is a post being shared on social media of one unfortunate candidate contesting in Matara from a major political party. The candidate had evidently made a direct translation of his slogan from Sinhala to English. The slogan in English reads “If you choose me You choose ‘You’ to do ‘You.”’ What the original message said in Sinhala was: if you elect him you would be doing a service to yourself. It didn’t take long for the image to go viral, with people pointing out the obvious unintended implication of the slogan. The post has now been taken down from the candidate’s Facebook profile, but is already widely available all over social media.